Pride of place amongst the stack of congratulatory cards and emails received by Oliver Sherwood following the Hennessy Gold Cup win of Many Clouds goes to one from fellow trainer David Pipe. An elaborately designed note sent by Pipe and his retired, 15-time champion-trainer father Martin, declares: "You can't keep a good man down." Not so long ago Sherwood wasn't so sure. The Pipes have seen close up how the then fashionable 'bright young thing' climbed quickly towards the top after starting out on the training ladder in 1984, only to dramatically falter and slip back down again a few years later. During a prolonged lean spell, the one-time top amateur jockey went perilously close to the edge: winners began to dry up, stable numbers dwindled and the write-off merchants circled in ever increasing numbers. More recently, the Sherwood's family home was badly damaged by fire. But now, not least thanks to Many Clouds, owned by businessman Trevor Hemmings, and the winner of a total of seven races so far, there's a feeling that the fortunes of Sherwood, 59, are on the up again. Asked what went wrong, the trainer of 998 winners - six at Cheltenham Festivals, though none for 20 years - agreed that success had perhaps come too easily early on in his career. He said: "I might have taken my eye off the ball. I was spoiled, I accept that, I hadn't had to sell myself. "And we had a couple of quiet years - bad years - and the horses weren't right. "I lost big owners who are hard to replace overnight, and I'm the world's worst at selling myself. "I don't like rejection, and hate ringing up somebody to sell a horse, it's just not me. It's like chatting up a girl, and her saying 'no, I'm not interested in you', awful. "It was hard and my confidence was severely dented, and you start doubting yourself, but the Hennessy brought a lot of the confidence back again which is great." To be fair, signs of revival have been detected in recent seasons with decent wins for Puffin Billy, Deputy Dan and Mischievous Milly. 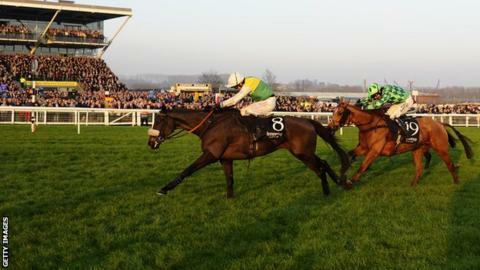 Those indications gathered pace when jockey Leighton Aspell steered the Many Clouds - whose mother is, appropriately, Bobbing Back - to what was an emotional return to the big time in Newbury's Hennessy feature. Always a popular figure, based just a few miles away from the Berkshire track in the Lambourn racing centre, he was feted noisily by the crowds, and tears welled. Ironically, only days earlier Sherwood, older brother of Desert Orchid's jockey Simon, had been in hospital after a piece of meat became stuck in his gullet. Yet he discharged himself, telling nurses: "I can't stay here. I train one of the Hennessy favourites and have to be home to supervise his final piece of work." Hopefully they took the tip. Now the next step is to build on all that, and aim the powerfully-built eight-year-old at the Cheltenham Gold Cup in March for which he's already rated sixth-best behind Silviniaco Conti at 16-1. To that end, the 'gentle giant' faces fellow big-race hopefuls Dynaste, Smad Place and 2014 winner The Giant Bolster in the Betbright Chase, Cheltenham's own Gold Cup warm-up. He will also be entered in the Grand National at Aintree. For a trainer who puts so much store in both himself and his horses having a confident outlook, Sherwood is delighted to report Many Clouds is thriving in that department. He said: "There's no doubt in my opinion he's changed this year and has got much more confident over what's done; it's sky high at the moment which is very important. "He's quite cocky when he's in his work, he thinks he's King Kong and his jumping and schooling at home since [Newbury] have been electric. "Despite all the effort he had to put in he got over it quickly, and we think that he's improved. I'm very happy with where he is. "Whether he's good enough [to be a Gold Cup contender], time will tell, but the gut feeling and instinct is that he is good enough and is a very realistic prospect." Naturally, Sherwood dreams that every horse that enters his historic 50-horse Rhonehurst base is a potential winner of jump racing's number one prize. Of course most are not, and in over 30 years he's only ever saddled one runner in the race, portentously perhaps his previous Hennessy hero Arctic Call, though he was pulled up behind Garrison Savannah in 1991. But the belief is clear that Many Clouds, for whom rain-softened going is desirable but not necessarily essential, could be different as he "ticks the boxes" on jumping, stamina and quality. Now the horse just needs to pass his next test, and it is actually a David Pipe-trained runner, Dynaste, the King George runner-up, who heads the field. I wonder if Pipe will soon be wishing Sherwood had taken a temporary dive back into the doldrums.